The second season of Stargate Universe was announced by Syfy on December 13, 2009. Like the first season, the second season consisted of 20 episodes. Nine episodes have already been reserved by the primary series writers. The series was moved from the franchise's usual time on Friday to Tuesday, along with Caprica. This is due to Syfy picking up WWE Friday Night SmackDown. The series resumed on September 28, 2010, USA. In Ireland & UK, the series resumed on October 5 at 9pm on Sky1 and Sky1 HD. Syfy announced on December 16, 2010 that it would not be picking Stargate Universe up for a third season and that the Spring 2011 season would be the last to air on its channel. There has been no word from MGM Television on this decision. As Destiny's crew continues to battle Lucian Alliance soldiers over control of the ship, T.J. finds herself and her baby transported to a safe place. Dr. Rush directs a shuttle to a planet inaccessible by Stargate — but a crash landing threatens to strand those on board. Meanwhile, Rush makes a stunning discovery on Destiny, and Young must decide what to do with his prisoners. Destiny encounters an Ancient seeder ship, which may hold the key to getting the crew home. But they soon find that the ship is not unoccupied. Chloe's increasingly erratic behavior leads the crew to suspect that she may be under alien influence. Eli returns home when he learns that his mother has fallen ill, and Camile finds Sharon struggling in her absence. Lieutenant Scott is infected by a plant-like organism while surveying a planet, and suffers severe hallucinations of another life back home on Earth. Colonel Young sees a recurring vision of Destiny being attacked and destroyed by hostile aliens, causing him to fear he is losing his mind. When Young and Rush are trapped on an abandoned alien ship, Rush has Amanda Perry brought on board in an attempt to steer Destiny to them while keeping his secret. Simeon makes his escape from Destiny, sending Nicholas Rush on a vengeful mission to catch him. But Young and Greer must attempt to retrieve Simeon unharmed. Members of the crew left behind in another galaxy make a shocking return to Destiny, while Chloe deals with the inevitable consequences of her transformation. The crew's newfound control over Destiny's flight path introduces new risks when they find themselves in the middle of a war between two races. Rush expresses concerns when Earth approves Eli's plan to dial the Stargate home from inside a star — and is proved right when a duplicate of himself shows up with a warning from the future. While a U.S. Senator visits Destiny, Camile and Sgt. Greer are trapped when Homeworld Command comes under alien attack. Chloe's body is taken over by the mind of someone the crew believed was dead. Meanwhile, T.J. must perform a dangerous transplant when Dr. Volker is diagnosed with an illness that threatens his life. Homeworld Command tries to convince an ally occupying a naquadria-rich planet to let them try to dial Destiny, but suspects they have already been infiltrated by the Alliance. The crew organize a desperate rescue mission after a predatory creature attacks an offworld team and takes two people captive. While attempting to return a group of colonists to their home, the crew finds records of their own alternate lives — and a planet on the verge of seismic destruction. Destiny is attacked by drone ships while attempting to recharge its power reserves, forcing most of the crew to gate to a nearby planet while Eli tries a risky alternative. ↑ Hibberd, James (December 13, 2009). "Syfy renews 'Stargate Universe' and 'Sanctuary'". thrfeed.com. http://www.thrfeed.com/2009/12/syfy-renews-stargate-universe-sanctuary-season-second-.html. Retrieved December 14, 2009. ↑ Sumner, Darren (April 15, 2010). "SGU, other Syfy dramas moving to Tuesdays". Gateworld. 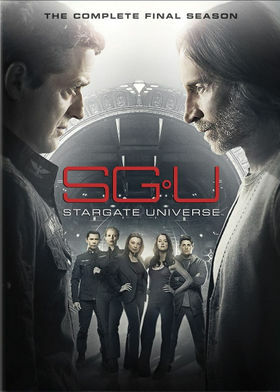 http://www.gateworld.net/news/2010/04/sgu-other-syfy-dramas-moving-to-tuesdays/. Retrieved June 12, 2010. ↑ "Syfy Cancels "Stargate Universe"". 2010-12-16. http://www.deadline.com/2010/12/syfy-cancels-stargate-universe. Retrieved 2010-12-16. This page uses content from Wikipedia. The original article was at Stargate Universe (season 2) . The list of authors can be seen in the page history. As with Semantic Stargate Wiki, the text of Wikipedia is available under the Creative Commons Attribution-ShareAlike 3.0 Unported (CC BY-SA 3.0). Facts about "Stargate Universe Season 2"
This page was last edited on 2 September 2012, at 21:24.